This complete 5 book masterpiece now fits conveniently on your e-book reader! 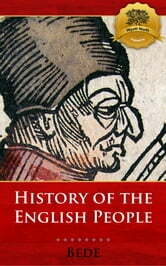 Bedes Ecclesiastical History of the English Nation comes complete with a Touch-or-Click Table of Contents, divided by each section. Bede, also referred to as Saint Bede or the Venerable Bede (Latin: Bēda Venerābilis), was a monk at the Northumbrian monastery of Saint Peter at Monkwearmouth, today part of Sunderland, England, and of its companion monastery, Saint Paul's, in modern Jarrow (see Wearmouth-Jarrow), both in the Kingdom of Northumbria. Bede's monastery had access to a superb library which included works by Eusebius and Orosius among many others. He is well known as an author and scholar, and his most famous work, Historia ecclesiastica gentis Anglorum (The Ecclesiastical History of the English People) gained him the title "The Father of English History". In 1899, Bede was made a Doctor of the Church by Leo XIII, a position of theological significance; he is the only native of Great Britain to achieve this designation (Anselm of Canterbury, also a Doctor of the Church, was originally from Italy). Bede was moreover a skilled linguist and translator, and his work with the Latin and Greek writings of the early Church Fathers contributed significantly to English Christianity, making the writings much more accessible to his fellow Anglo-Saxons. You can buy other wonderful religious books from Wyatt North Publishing!